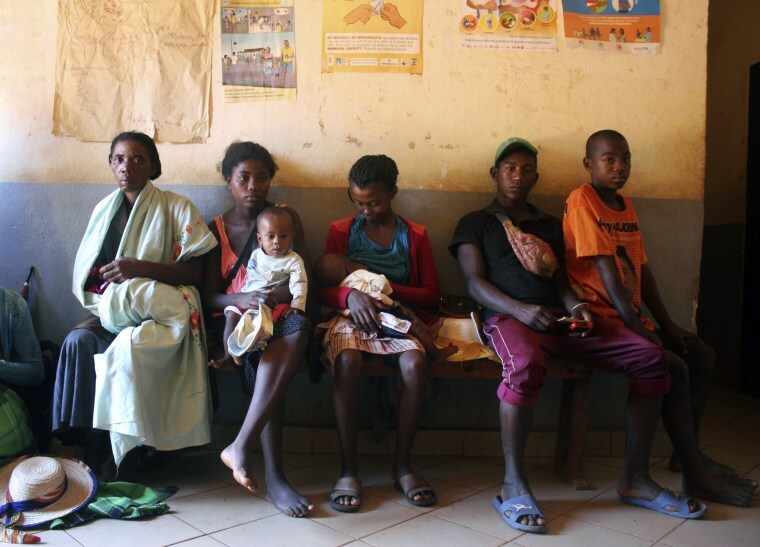 In Madagascar, many parents would like to protect their vulnerable children but face immense challenges to receiving vaccines. AMBALAVAO, Madagascar — Babies wail as a nurse tries to reassure mothers who have come to vaccinate their children. They fear a measles epidemic that has killed more than 1,200 people in this island nation where many are desperately poor. Measles cases are rising in the United States and other parts of the world, in part the result of misinformation that makes some parents balk at a crucial vaccine. New York City is now trying to halt a measles outbreak by ordering mandatory vaccinations in one Brooklyn neighborhood. Just 58 percent percent of people on Madagascar's main island have been vaccinated against measles, a major factor in the outbreak's spread. With measles one of the most infectious diseases, immunization rates need to be 90 to 95 percent or higher to prevent outbreaks. On a recent day the Iarintsena health center's waiting room was full, with mothers sitting on the floor and others waiting outside in the overwhelming heat. Two volunteer nurses and a midwife tried to respond to the demand. "He has a fever," she said. "I think it's measles because there are these little pimples that have appeared on his face." The nurse quickly confirmed it. "I'm so scared for him because in the village everyone says it kills babies," Razaijafisoa said. The measles outbreak has killed mostly children under age 15 since it began in September, according to the World Health Organization. "The epidemic unfortunately continues to expand in size" though at a slower pace than a month ago, said Dr. Dossou Vincent Sodjinou, a WHO epidemiologist in Madagascar. By mid-March, 117,075 cases had been reported by the health ministry, affecting all regions of the country. This epidemic is complicated by the fact that nearly 50 percent of children in Madagascar are malnourished. "Malnutrition is the bed of measles," Sodjinou said. Razaijafisoa's baby weighs just 11 pounds. Madagascar's health ministry has sent free medications to regions most affected by the epidemic. Maronko reminded heads of health centers in the Ambalavao region not to make parents pay, saying he had seen some doctors asking for money. He told the AP he feared the medicines wouldn't be enough. "I had 5 children. They all had measles. For the last, I did not go to see the doctor because I did not have money," she said. "I gave my baby the leftover medications from his big brother to bring down the fever."